It has been a great year of reading for me. From Jonathan Franzen’s Freedom to The Year of Magical Thinking to The Thousand Autumns of Jacob De Zoet to Quarantine and many such gems, 2010 was truly a reader’s year and I have loved every book I have read. Most people ask me: How come you end up liking/loving every book you read? I just tell them this: I do not read bad books and it is true, I do not. There is no time to read bad books and it is a fact. I mean imagine all the mediocrity around you and I definitely do not want my books to be ridden with that. A lot has happened with me and my books in the past year. Fights with my mother about stocking them and how will one ever create space, to which I promptly reply: Who needs anything else? Only a true book lover will understand this. I do not expect anyone else to. There have been speculations about a Nook or a Kindle taking over the physical book form and I shudder at the thought of this one. How can you smell the pages while reading a book on Kindle? Who can compare to that one feeling of holding a book in your hand and feeling the pages? Technology is so outdated. This entry was posted in Books, Memories on December 30, 2010 by thehungryreader. I received, “Squirrel Seeks Chipmunk: A Modest Bestiary” by David Sedaris in the mail yesterday and finished it this morning. I could not stop reading and loved it to the core. I remember reading, “Me Talk Pretty One Day” a long time ago and also the fact that I could not stop laughing. I was almost in tears at the end of it and “Squirrel Seeks Chipmunk” was no exception. What we have here is a unique and absurd collection of what appear (on the surface) to be anthropomorphic animal characters- squirrels, storks, cats, toads, turtles, and of course a duck. Each story starts out benign and normal enough, more or less like an Aesop’s Fable, but then gets more preposterous as far as animals go and then more and more relevant to life as we live it today. In other words, each story holds up a mirror to our everyday life- but this being David Sedaris it’s more a Wonderland or Funhouse mirror. Perhaps the closest I could come would be Aesop’s fables written by a very modern Lewis Carroll. The mirror has shattered, and each little tale here is a sharp shard. There is a danger that if you handle the jagged pieces you will cut yourself. The sardonic self-interest of the cat, the anxious spirituality of the brown chicken, and the bemused acquiescence of the chipmunk—David has exposed these all-too-human characteristics but he has not given us himself as a human lightning rod to accept and defuse the psychological voltage. The animals in these parables, true to type and operating as they do out of unapologetic instinct, certainly can’t absorb any of the shock, and we are left alone, face-to-face with our own pettiness, cruelty, wisdom, ignorance, tenderness, heartbreak. The tales are sometimes laughable and sometimes excruciatingly uncomfortable, and almost always brilliant. As fables, they are simply written—but they are definitely not for children despite the cartoonish illustrations. They are not for adults who wish to remain ignorant of their human failings either. Like all good fairy tales, they are instructional, but only if you pay attention and apply the parallels. The cruelty and darkness that some reviewers mention is a standard function of cautionary story-telling, and it’s there to grab your attention; it provides the necessary tension so that the reader is drawn in, either through outrage, fear or discomfort. There is a grotesque element operating here that gentler readers will have difficulty reckoning with. I am one of those, and my first instinct was to say: forget it! But I went back over the parts that had first offended me, and with a second reading found that David’s sense of humor was intact; it was mine that had been lacking. His insights remained unflinching and devastating. 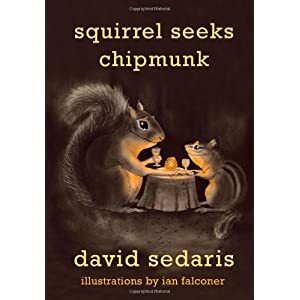 Although SQUIRREL SEEKS CHIPMUNK might not be the usual fare readers have come to expect from David Sedaris, it has all the earmarks of what makes his nonfiction truly remarkable: biting wit, caustic satire, and an ever-so-subtle detection of a wink aimed toward his readers. Ian Falconer’s illustrations provide the perfect accompaniment to these acerbic tales. Unexpected, yes, but this slim volume provides a refreshing change of genre from one of our most treasured and talented writers. As you read, the pieces of the broken mirror reassemble, and by the end of the book you will be able, once again, to see a reflection. It’s you alright, with the tail of a rat, the talons of the owl, the pecked neck of the fowl. Cringe. Laugh (sheepishly). Change your attitude. Think twice. Hold your tongue. Examine your motivations. It’s uncomfortable but it’s necessary. How else can we become more aware if not through the shock of self-recognition? And how else can we grow unless we see how small we really are? This entry was posted in Authors, Authors I Love, Books, david sedaris, Fiction, humour, Review and tagged aesop, animals, black humour, david sedaris, hachette book group, humans, jataka, little brown and company, mirror to the society, panchatantra, sarcasm, society, squirrel seeks chipmunk, tales, values, wit on December 28, 2010 by thehungryreader. I have not read “The Storyteller’s Tale” by Omair Ahmad, but now I will. I have just finished reading, “Jimmy the Terrorist” and I am still thinking about it. I have had a great year of reading. 2010 has been perfect and it just got better with this book added to my reads this year. Terrorism has always and sadly enough will always be an intricate part of our lives. Off late, it has seized us with fear and everything that comes with it – the insecurity, the deep down scare in people’s eyes about what is going to happen tomorrow and threats from almost every religious fundamentalist group. Books like “Jimmy the Terrorist” hold a mirror to our society and how is it depleting its values and what people stand for. It jolts you from your deep slumber and at some level makes you want to make that difference, the only bone of contention being: We don’t know how to make that difference. Jimmy the Terrorist is set in the northern part of Uttar Pradesh, India around 1990 in a fictional town of Moazzamabad. The town speaks of alienation of the Muslim community and the people who live in it. The story is about a guy called Jamal who becomes a terrorist after stabbing a police inspector and is in the process, beaten to death. Before he breathes his last, he mouths the words, “My name is Jimmy the Terrorist” and that is where the story begins. Journalists throng in from every part of the country (I liked the way media was thrashed in the book to some extent. It also reminded me of Peepli Live) wanting to gnaw on every piece of news they can obtain. The story then moves forward in backwards talking about Jimmy’s life and what shaped him to become the person that he was before he died. It also talks about his father Rafiq, their circumstances, the marginalization faced by the society, the bringing down of a mosque in Ayodhya, to how people are treated in a country that is supposed to be a democratic one. The idea and what the book represents is simple: Religion is not the answer to our problems – be it any religion and it can never be. The book revolves around a small town and its issues and how everything is defined by politics and religion. Human sentiment and emotions in such times seems to have taken a walk and quite literally at that. Jimmy did have a life before he died and no one wanted to know about it till his death was reported. Jimmy the Terrorist is a story of today’s India and how it is pockmarked with various troubles – from communalism to riots to its own agenda set by different people separately. Jimmy is an outlier in the society – may be there aren’t many of his kind, and yet they exist or are made to exist. Democracy speaks for the majority and not the minority and may be that is a concern. We are still living with the hangover of partition and that needs to end. This entry was posted in Authors, Books, Fiction, indian fiction, Review and tagged democracy, fundamentalists, hamish hamilton, identity, jimmy the terrorist, marginalized, minority, muslims, omair ahmad, penguin india, terrorism on December 26, 2010 by thehungryreader. I found this book to be a fascinating insight into the household of Queen Victoria. It’s quite incredible that a hundred years ago, a British Queen befriended an Indian Muslim, not only that, but she learnt to read, write and yes speak Urdu. It really changed my opinion of the queen and showed that she was in fact a very compassionate woman who did not hold any bigotry towards Indians or indeed Muslims. For this insight alone, I think the book is worth it, it’s scarcely plausible now to imagine a British Muslim as an aide to the prime minister/queen; this book captures what it was to be in her household. The unspoken parallels of his association with a British Muslim intellectual of the time (Rafiuddin) and the British establishment’s belief that he might be a malcontent when in fact he stated Britain might be a positive force in India are quite amusing when compared with this day and age. Now too, Muslims are apt to be tarred and feathered merely for meeting other Muslims, who might not even be radical, just perceived to be so. It seems some things just don’t change. I would have liked the book to be a bit longer and discuss more of what happened to Abdul Karim after Queen Victoria passed away, there are suggestions that Abdul Karim grew pompous in his old age, I would like to have seen that expanded, but like another review stated, it allows people draw their own conclusions. After all, class and status are so utterly artificial, when we die, people remember us for our actions, not the wealth we accumulated. I now remember Abdul Karim as the man who taught Queen Victoria Urdu, and care little for the man who sought to leave a cushy life in Agra in his retirement. This entry was posted in Books, Non Fiction and tagged british muslim, british raj, cook, england, India, london, Love, queen, rupa and co, sharbani basu, victoria and abdul on December 26, 2010 by thehungryreader. I guess I have never enjoyed reading short stories as much as I enjoyed reading this collection by Premnath. Crowded Rooms is sure going to haunt me for a while and that too quite strongly if I may add. Why you ask? Well for one the 9 stories in this book are not your usual run-of-the-mill tales and second they have what it takes to make the reader ponder long after you have finished reading the book. “Everyone seemed to be calling everyone and there was no explanation why”. Consider this line. It is simple and yet so stark. It defines the way we are living and yet so effectively. This is from the first story in the book “The Room with the Lamps” and is about Maya and her lamps and one crazy night in the city. About meaningless vandalism and how guilt makes people do senseless things – for no rhyme or reason. It wasn’t a surprise to see and realize that every story was centred around and was about urban existence. About how we value our possessions and may be are so entwined in them that we fail to see life for what it is. “Where were all the beautiful, people, the sunny beaches, the chatty hosts, the trees and the mountains?” This line is from the second story in the book, “TV is Good”, and is about an angry television that comes looking for his master who dared to turn him off. And another one of an Office Memo coming to life – dreamlike metaphors and holds such truths for our times. While in, “The Chronicles of a Saturday Evening” something unseemingly occurs that leads to to people coming close. One of the best stories in the entire collection. The stories as the title suggests are about spaces – the ones that we inhabit and the ones that we forget to look or think about along the way. The stories encapsulate lives we have seemed to forgotten – the small joys and sometimes the small bites of pang that surface unexpectedly. This entry was posted in Authors, Books, short stories and tagged cabins, crowded rooms, depression, dreams, highways, Love, penguin, penguin india, premnath, spaces, urban life on December 23, 2010 by thehungryreader.